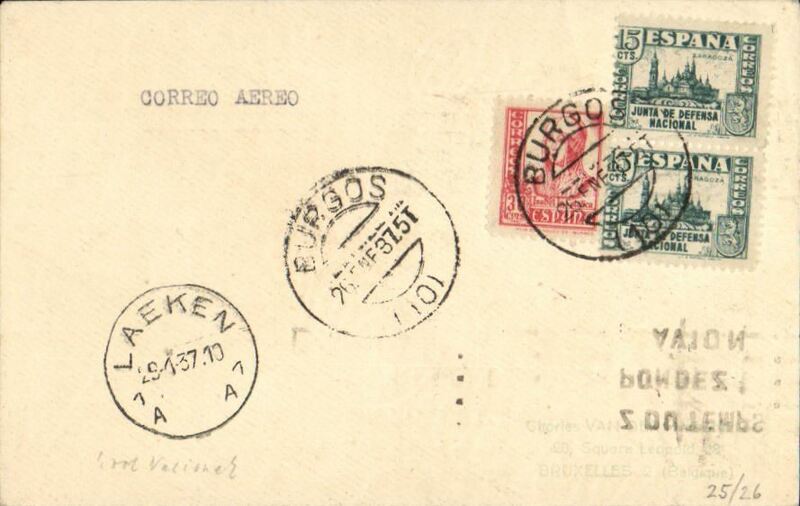 Spain to Argentina, pre-printed Aeropostale cover postmarked Barcelona June 7, 1930 to Cordoba (Argentina), bs Buenos Aires 16/6. Franked with Sc. 338, 341 and 342 (2). 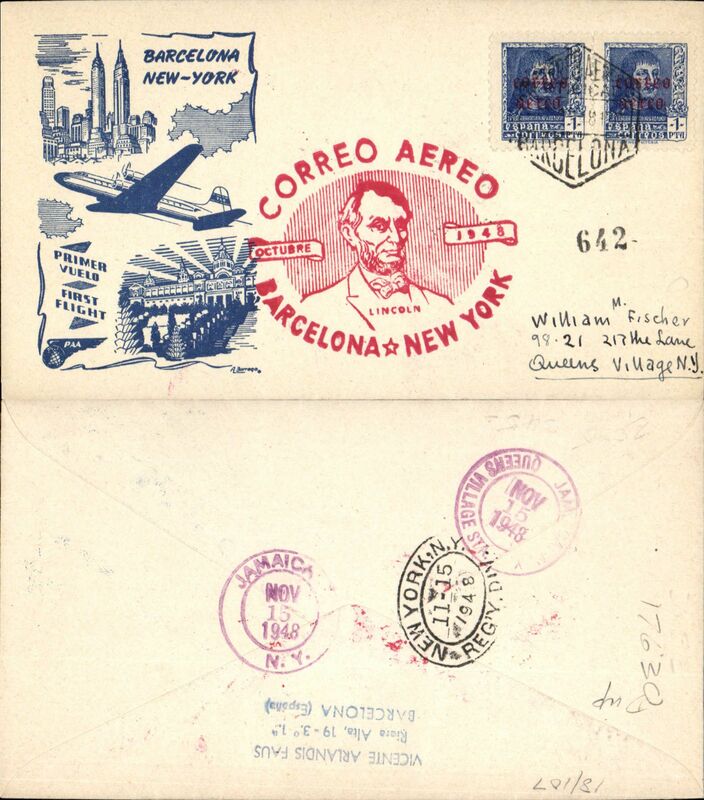 Aeropostale covers from Spain to South America are surprisingly scarce. 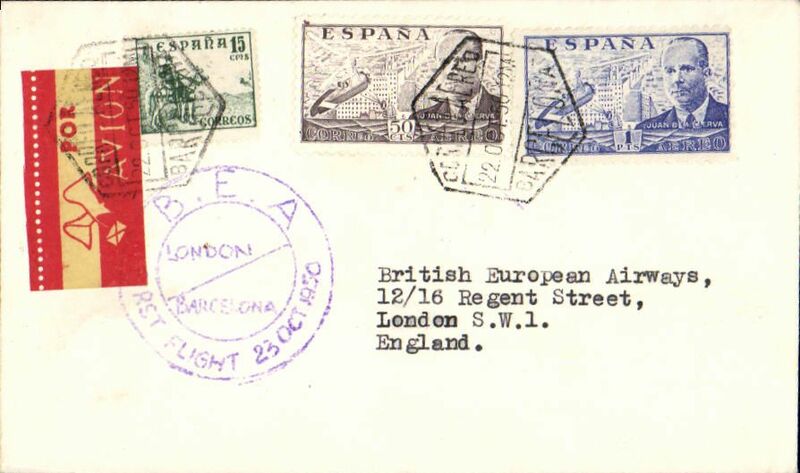 Seville Exp Goya, Seville to Madrid, cover franked 1930 Goya airs to 1P and 20c 'Urgente' canc special Expo hexagon postmark, tying triangular red/cream 'Par Avion' etiquette. Attractive item. 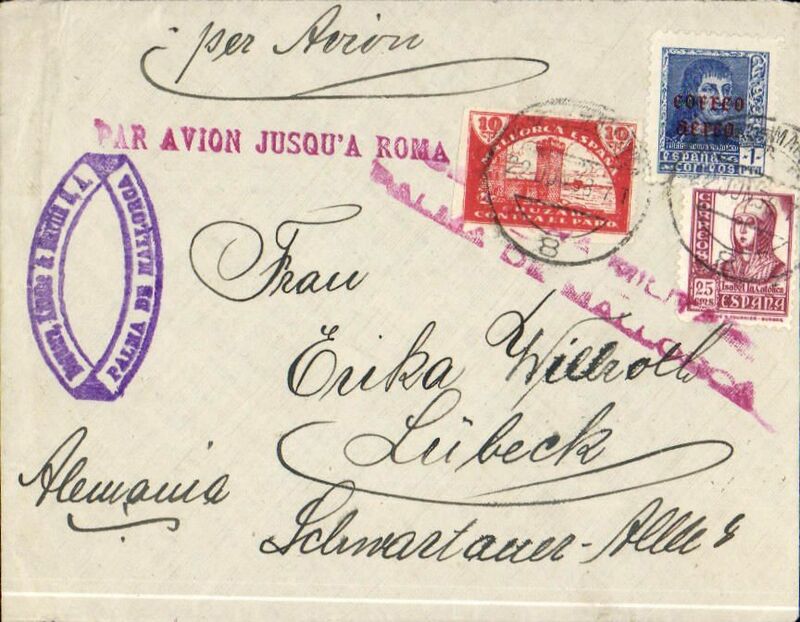 Spain to Switzerland, Barcelona to Lucern 7/11, via Paris 6/11, registered cover franked 1931 2nd Republic opts 2c strip x5, 5c strip x5, 15c and 30c, canc rectangular Barcelona registered postmark, ms 'Barcelona-Lion-Paris'. 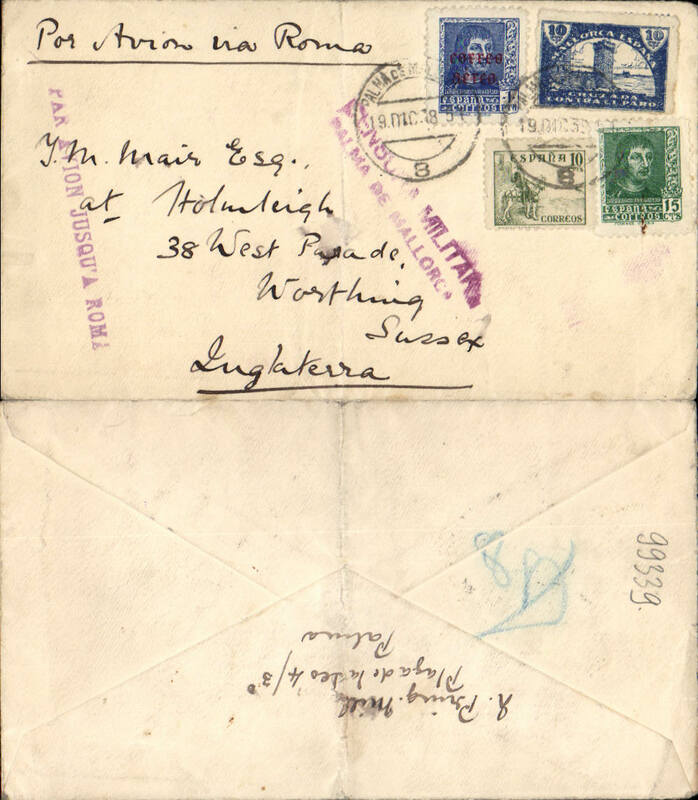 Attractive early airmail cover in fine condition. 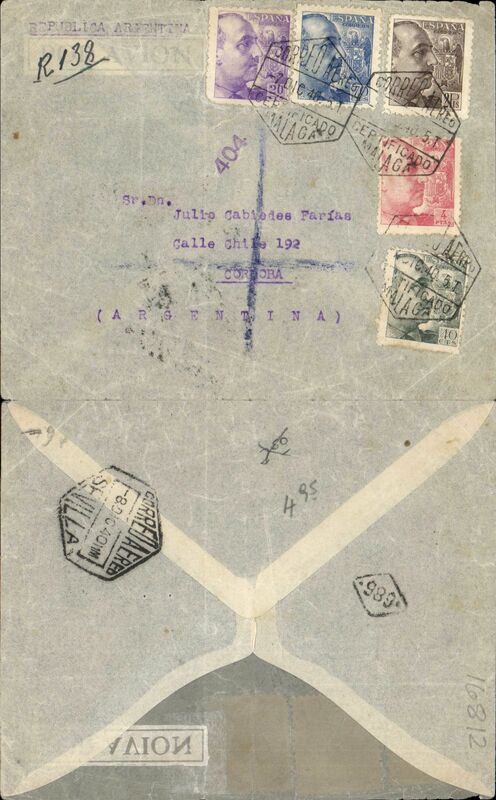 Acceptance from Spain for Argentina, pre-printed Spanish Air France registered cover postmarked Cadiz April 1, 1935 addressed to Buenos Aires with arrival b/s April 11th. Large "Viva Cristo Rey" sticker on back. 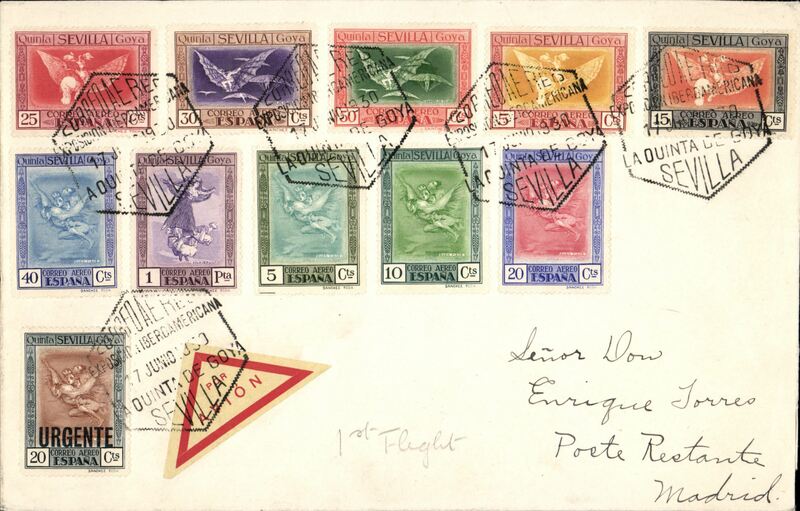 It is known that mail left Paris on April 6th to be carried on all-air service using the Santos Dumont (flight 15A) but known examples of that mail have an arrival b/s in Buenos Aires of April 9th. 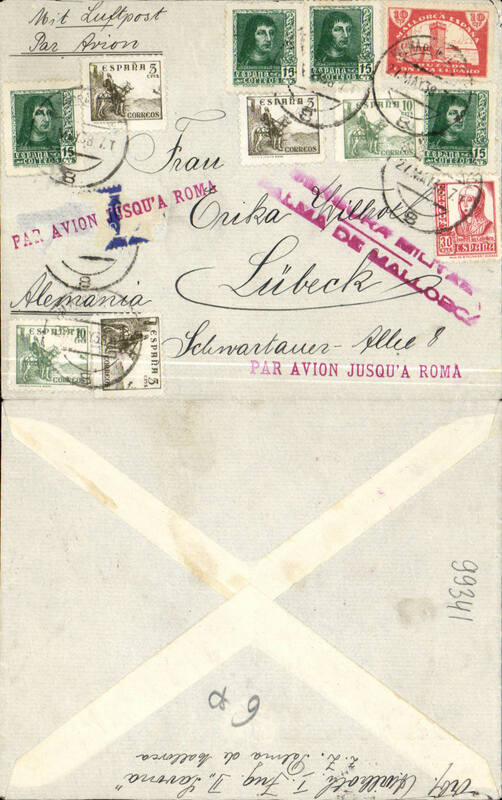 It is possible that this cover was flown to Dakar but arrived too late for the Santos Dumont flight and put on board the usual aviso instead. 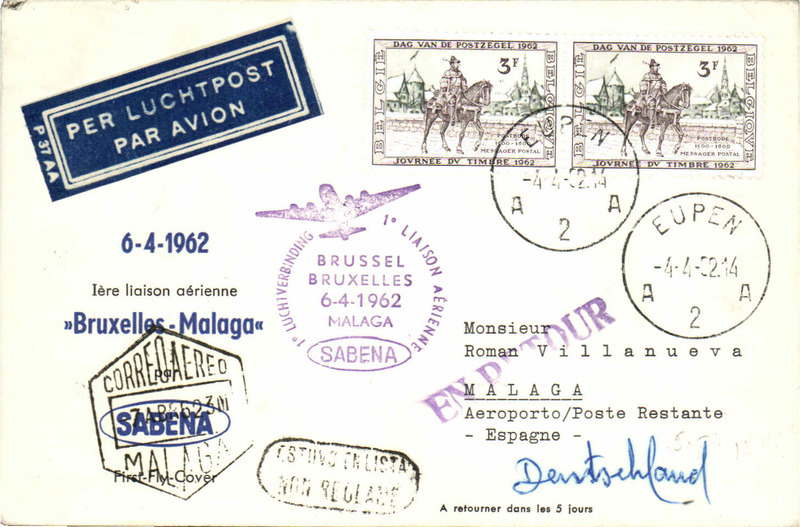 In other words, there may have been two sets of mail for that date, the mail gathered in Paris for a direct Toulouse/Marseille - Dakar- Natal flight,and the mail picked up on the way which followed the usual plane-aviso scenario. Collot and Cornu do not expand on this possibility. 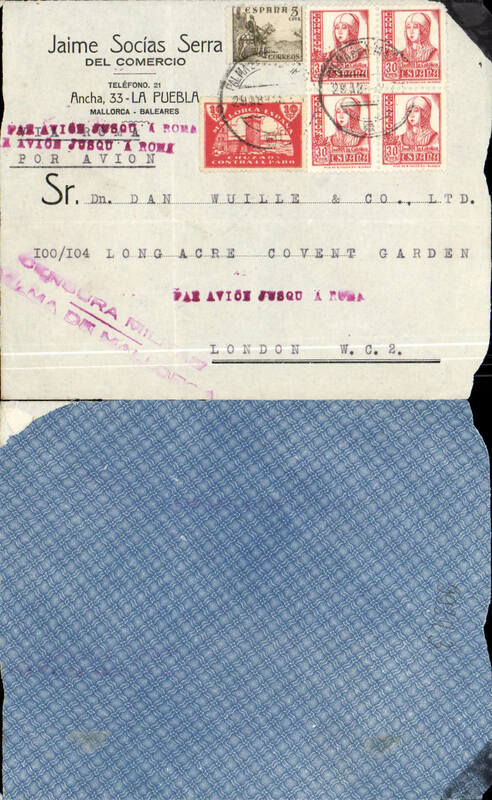 Spanish acceptance for carriage on DLH South America Airmail service to South America, Seville to Buenos Aires, bs 3/12, registered (hs) lightweight grey/blue Lufthansa airmail envelope with etching of Zeppelin flying above DLH monoplane for use by customers in Spain, franked 3.80P to cover base,air & registration fees), canc octagonal 'Amb.Andalucia/Certificado/27 Nov 35'. Attractive item. 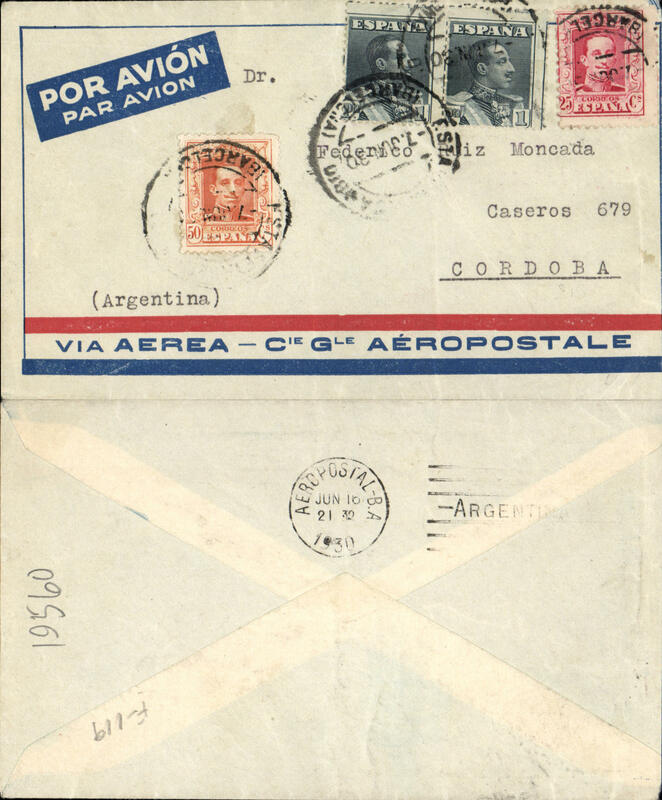 Acceptance from Spain for Argentina, very scarce pre-printed Aeropostale Spanish envelope “Por Avion Par Avion Via Aeropostale” postmarked Bilbao (Spain) December 3, 1935 with transit b/s Buenos Aires December 14 and arrival b/s Comodoro Rivadavia December 20th. 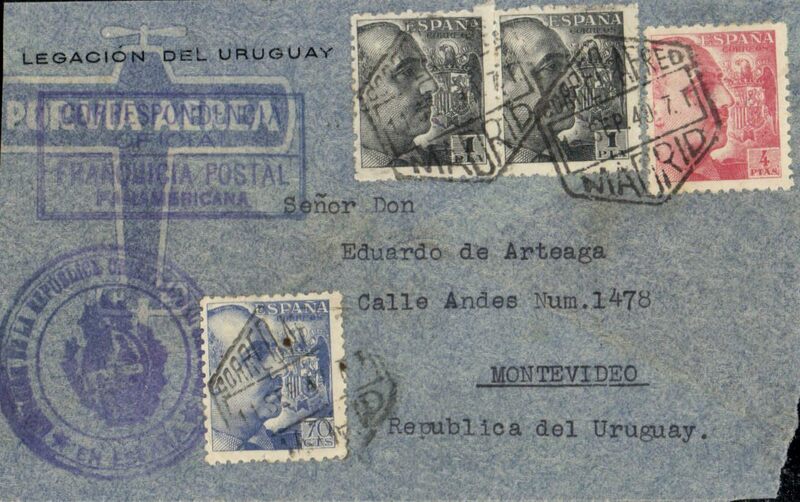 The cover travelled by surface mail from Buenos Aires to Comodoro. 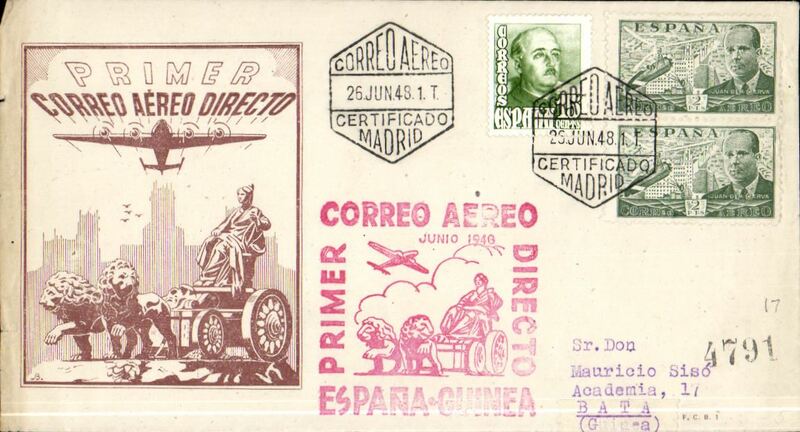 Scarce acceptance Spanish flight and rare Aeropostale envelope especially since Air France had taken over Aeropostale the previous year. 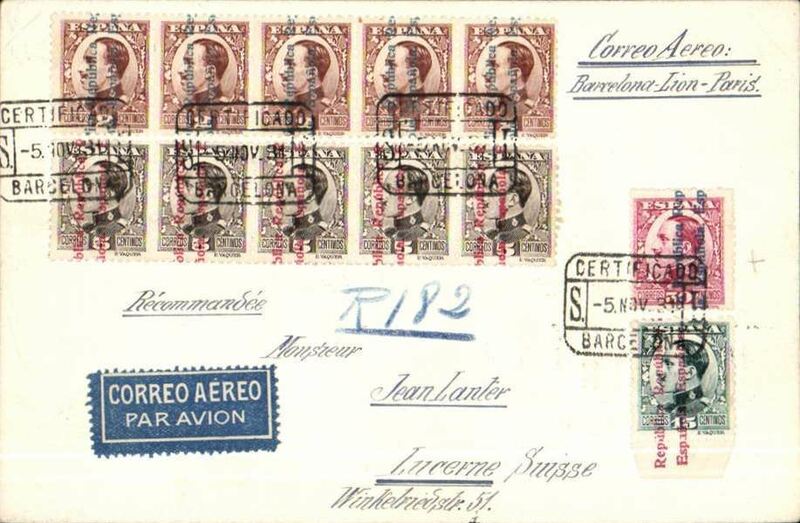 Spain to Belgium, bs Laeken 29/1, via Marseille Gare-Avion and Paris Avion 28/1, plain cover franked 30c and 15c x2 'Junta de Nacional Defensa Zaragosa, typed 'Correo Aereo'. 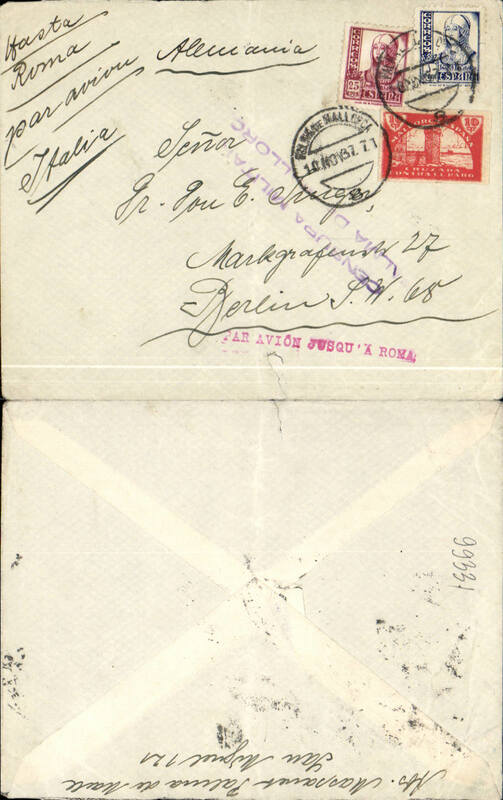 Civil war cover, Las Palmas, Canary Islands to New York via Germany, registered airmail cover franked 2P canc black framed /certificado/10 Mar 38/Las Palmas', bs New York 21/3, vi Frankfurt 13/3, violet two line "Censura Militar Las Palmas" censor mark verso. 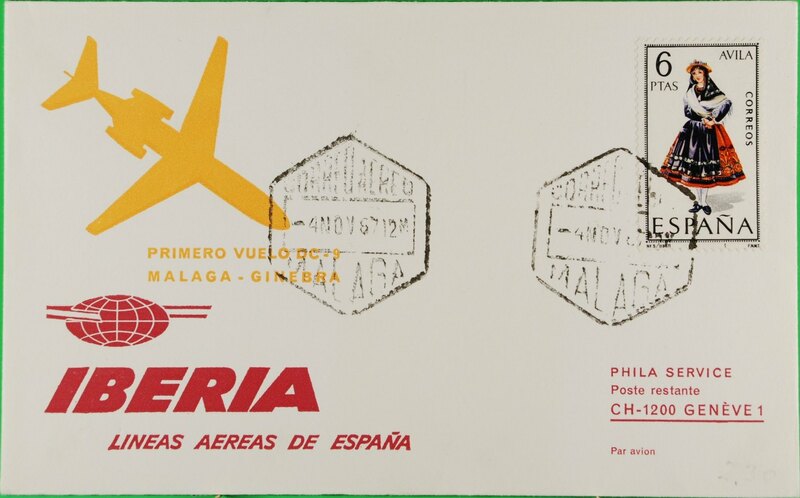 Flown DLH from Canary Islands to Germany, then likely OAT to Cherbourg and sea to New York by Europa/Bremen. 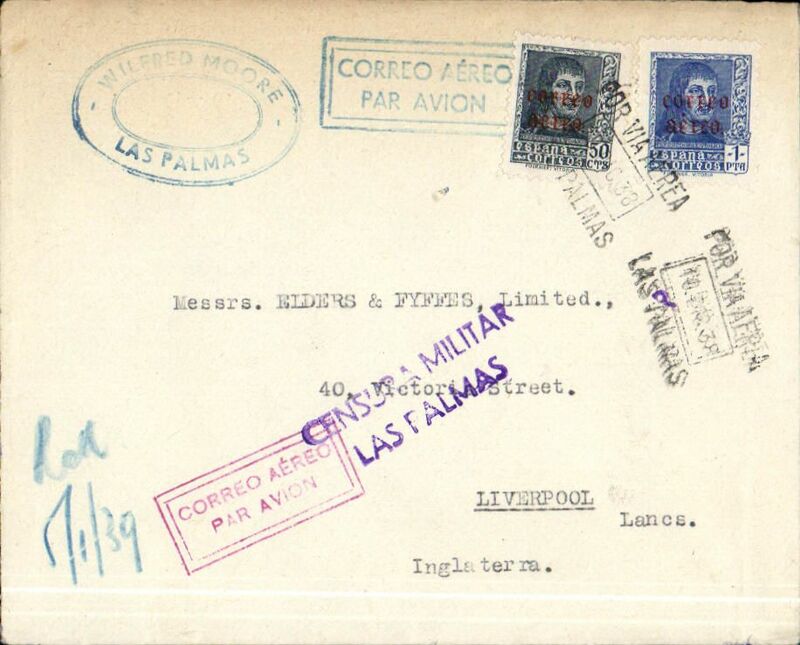 Spanish Civil war cover, Las Palmas, Canary Islands to England, no arrival ds, plain cover franked 1P50 canc black 'Por Via Aerea/10 Dec 38/Las Pamas' postmark, violet two line "Censura Militar/Las Palmas" censor mark, red framed and blue framed "Correo Aereo" hs's. 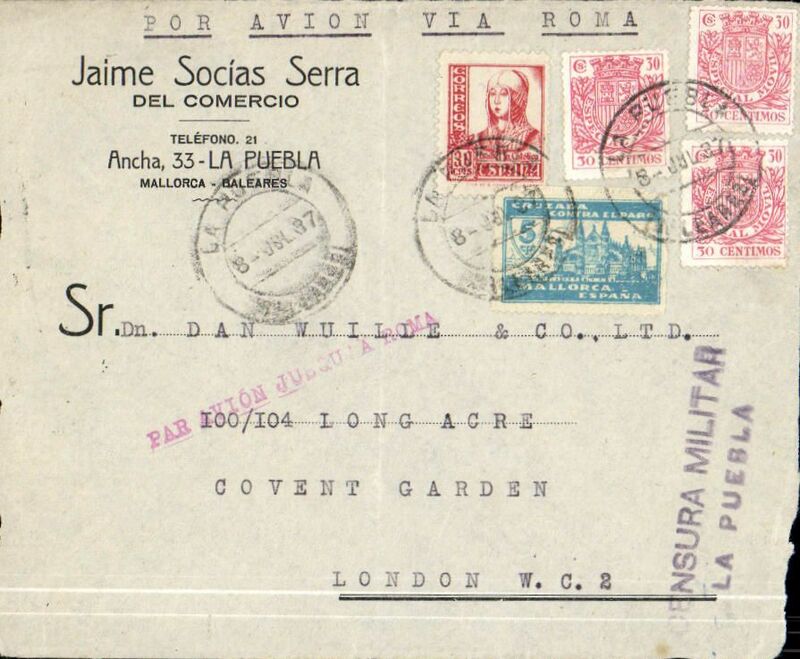 Spanish Civil war cover, Las Palmas, Canary Islands to England, no arrival ds, plain cover franked 2P20 canc black 'Por Via Aerea/13 May 39/Las Pamas' postmark, violet two line "Censura Militar/Las Palmas" censor mark, red framed "Correo Aereo" hs. 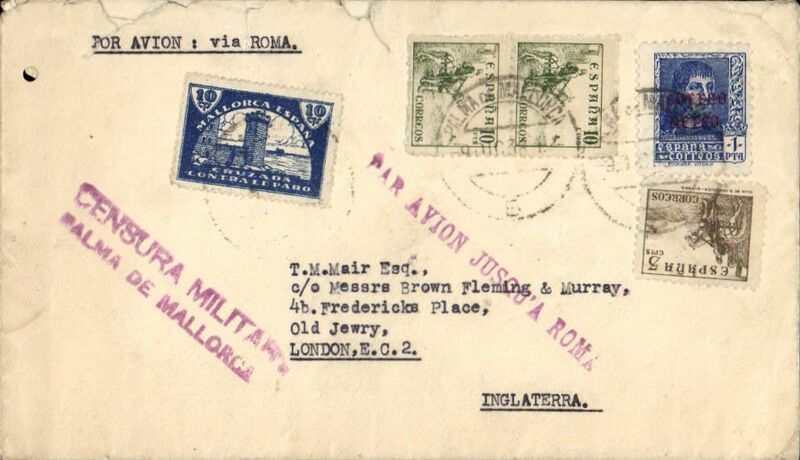 Early WWI dual censored airmail cover, Valencia to London, b/s, commercial corner cover franked 2.20P, canc Valencia cds, violet framed 'Censura Military/Avion/Valencia Del Cid' military censor mark verso, sealed with GB PC66 OBC 1416 censor tape, large blocked violet 'Par Avion' hs. 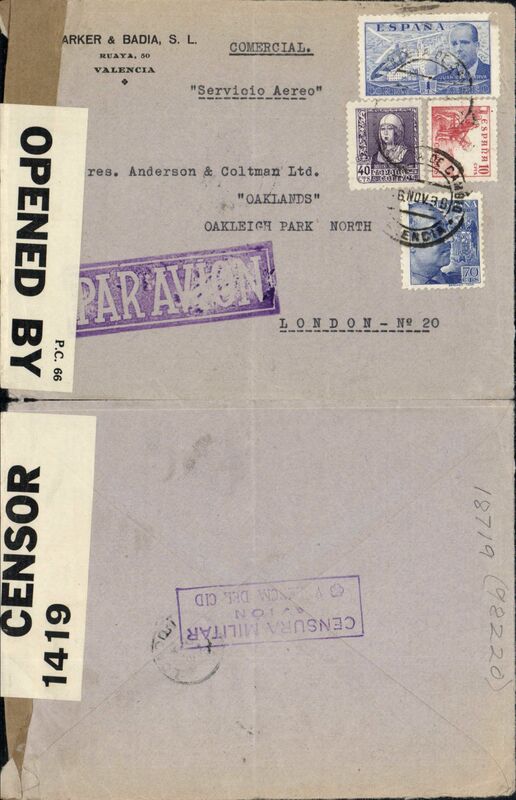 PC66 censor tape was used on civil mail from shortly before the start of WWII until mid 1940, thereafter on POW mail. Nice item. 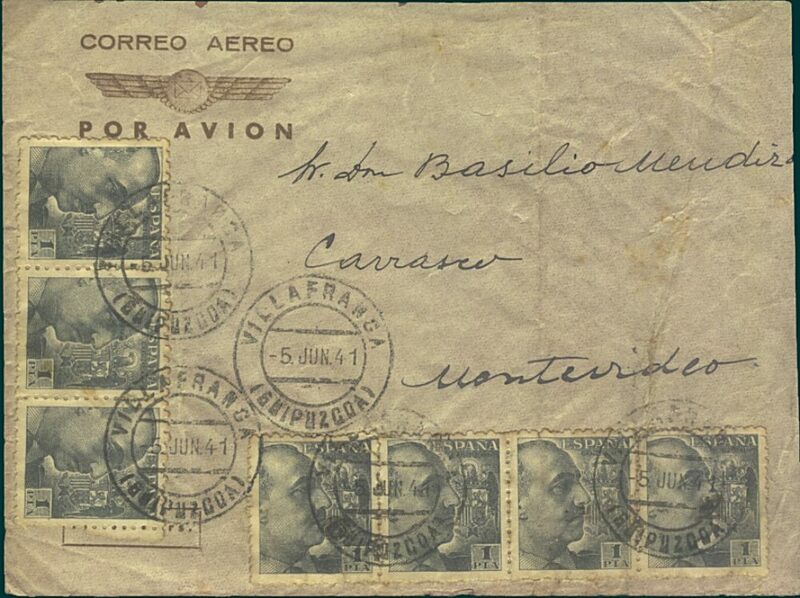 Spain to Uruguay, Madrid to Montevideo, bs 23/4, flown by LATI, censored WWII 'Fabricas de Gaseosa' cover franked 6P 90c, canc Madrid 14 Abr 40 cds, fine blue/white four line "Via LATI" service etiquette, violet framed 'Censura Millitar' hs. Correctly rated for carriage by LATI from Spain to South America. 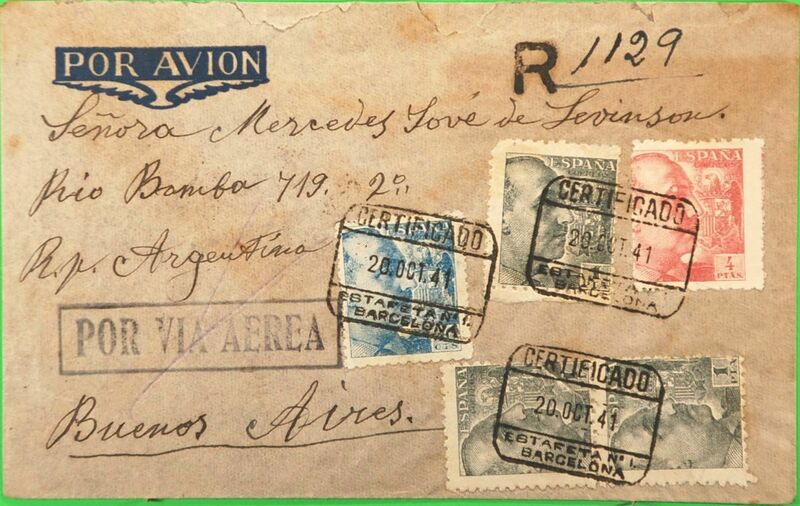 Carried by LATI all the way from Rome to Rio de Janeiro, and by Condor or Panagra to Montevideo. 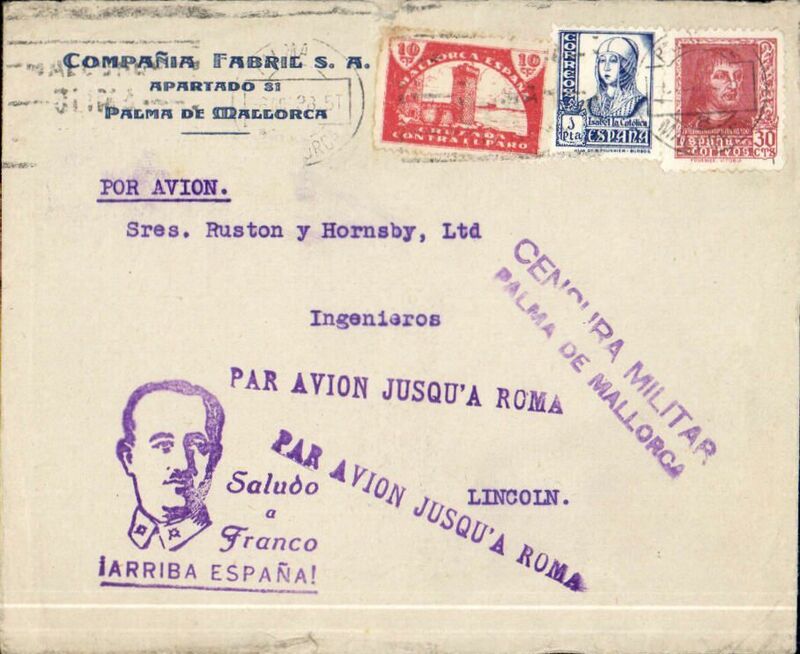 Spain to Uruguay, flown by LATI, a rare uncensored WWII Uruguay Consular airmail corner cover, Madrid to Montevideo, b/s, franked 6P 70c, canc Madrid 11 Sep 40 hexagonal ds, uncommon boxed "Correspondencia/Official/Franquicia/Panamerica" hs's front and verso, and large Uruguay Consulate in Spain cachets front and verso. Correctly rated for carrige by LATI from Spain to South America. 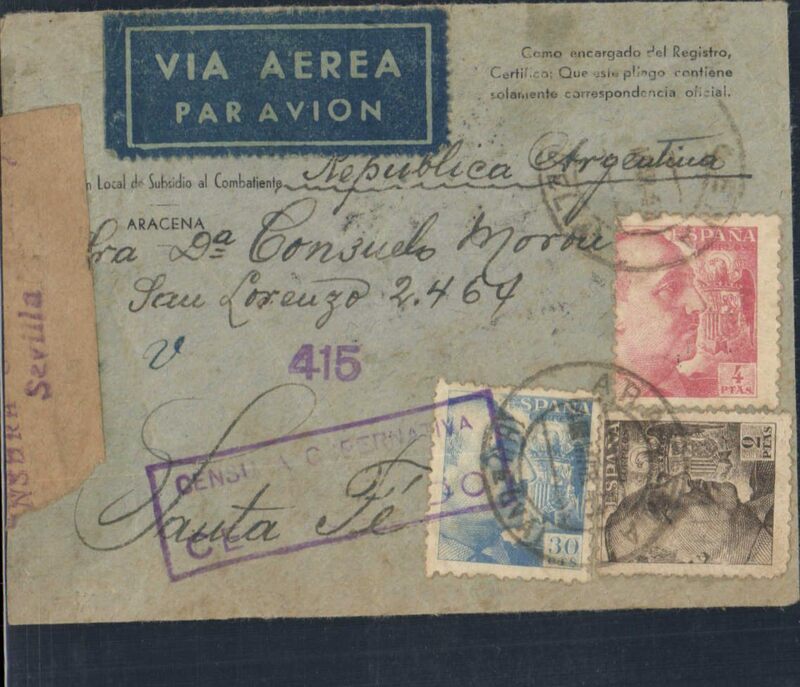 Carried by LATI all the way from Rome to Rio de Janeiro, then Syndicato Condor to Buenos Aires, thus avoiding the British censorship on the Pan Am North Atlantic service, and by Condor or Panagra to Montevideo. Neat non invasive 5mm trims on right and left sides, increasing to 1cm bottom rh corner, and verso neatly consisits of top and bottom flaps held by residue of wax seal. 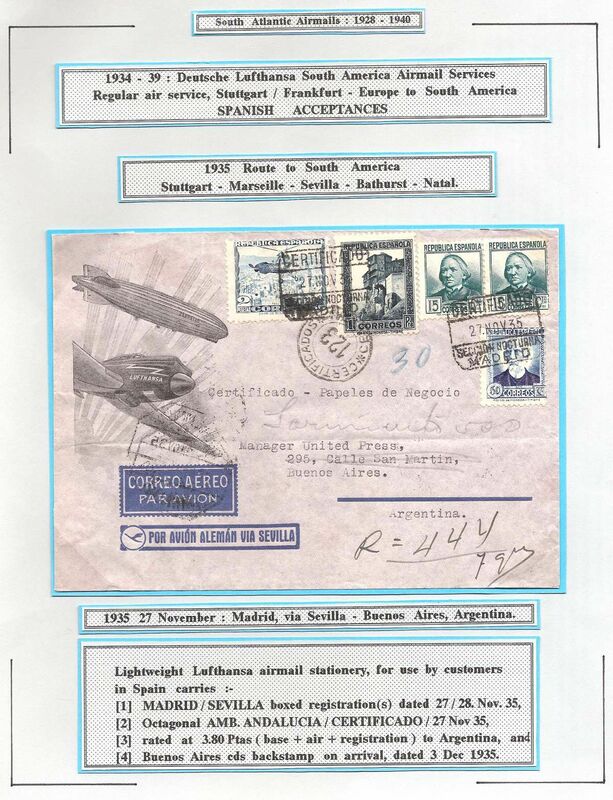 LATI, Spain to Argentina, censored single rate WWII registered airmail cover, Malaga to Cordoba, black '686' in diamond Cordoba postmans mark, franked 7P 30c canc Malaga/7/12/40 hexagonal ds, via Sevillle 8/12, typed "Republica Argentina", uncommon purple Spanish unframed censor mark #404, see Stitch&Stitch p200. 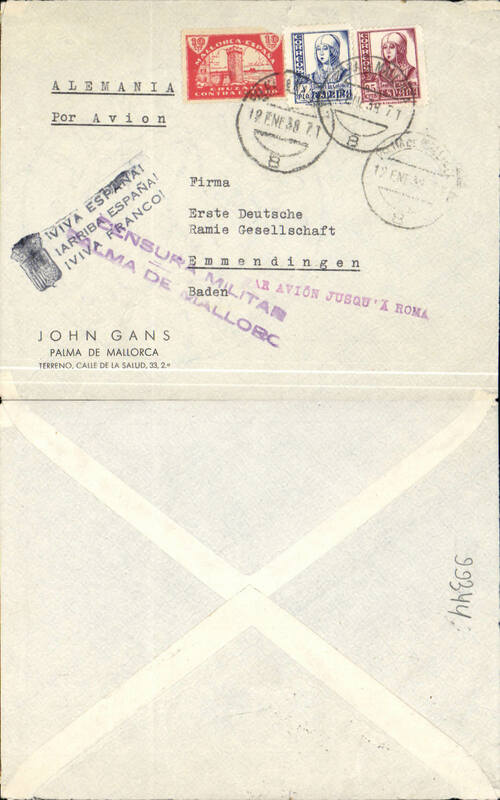 Military censorship of the mails was still the rule in Spain for some years after the end of the Civil War. Correctly rated for 5g registered Spain to Argentina by LATI, 6P/5g air fee + 30c/20g surface + 1P registration. 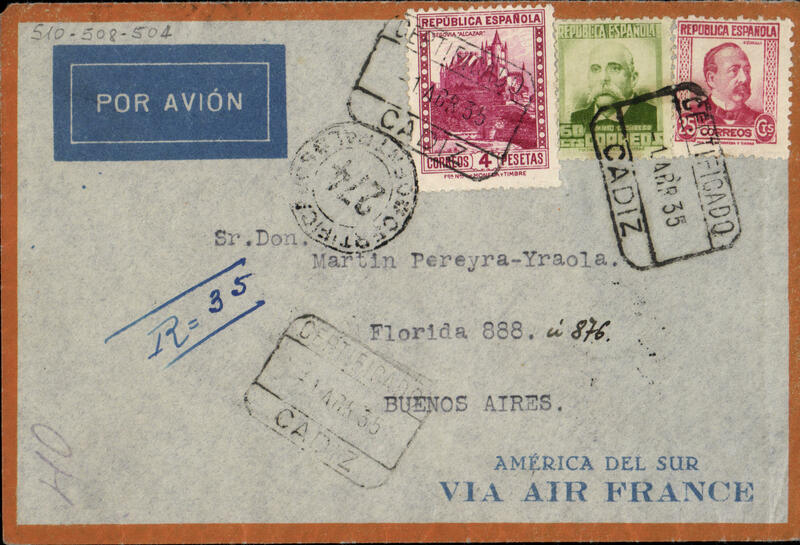 Carried by LATI all the way from Rome to Rio de Janero, then Syndicato Condor to Buenos Aires, thus avoiding the British censorship on the Pan Am North Atlantic service. Flap missing, non invasive top edge tear, barely visible from front. 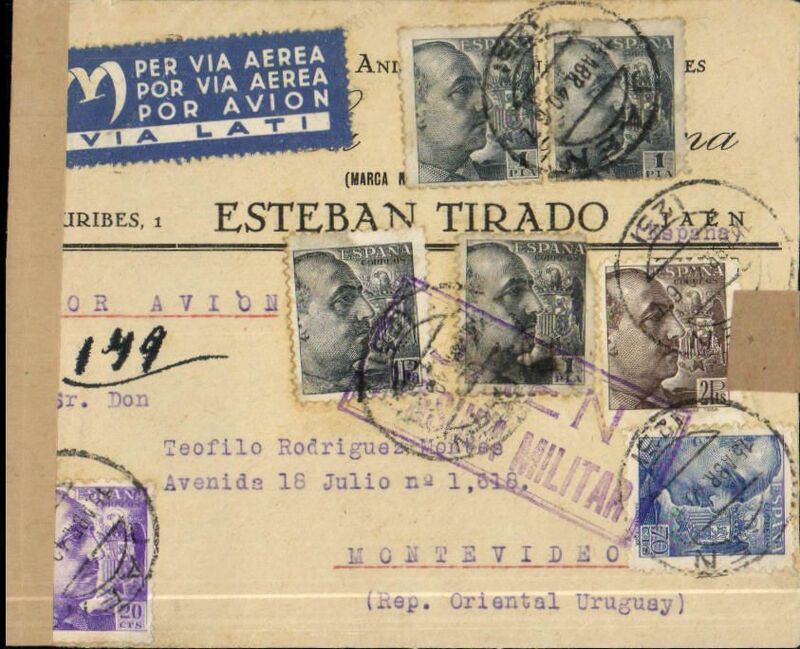 LATI, Spain to Argentina, single rate censored WWII uncommon printed "Como encargado del registro certifico.Que este pliago contiene solamente correspondencia oficial" envelope Aracina to Santa Fe, bs 11/3, also 664 in circle postman's arrival mark, franked 6P 30c canc Aracina/Huelva 4/3/41 cds, via Seville, black hexagonal Correo Aerea/Seville/6/3/41ds verso, blue boxed "Por Via Aerea", blue boxed "Censura Gubernativa/(Sevilla)/Censurado" censor mark on front, sealed purple/brown "Censura Gubernativa/Sevilla"censor tape. 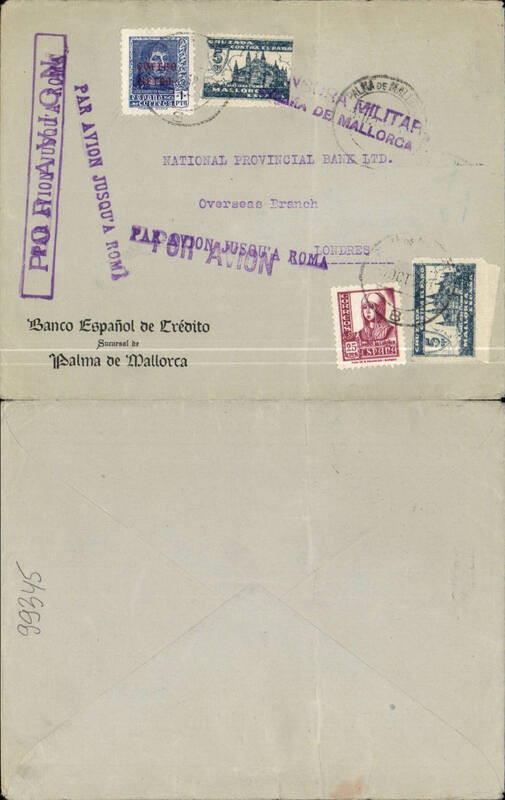 Military censorship of the mails was still the rule in Spain for some years after the end of the Civil War. Correctly rated for 5g Spain to Argentina by LATI, 6P/5g air fee + 30c/20g surface. 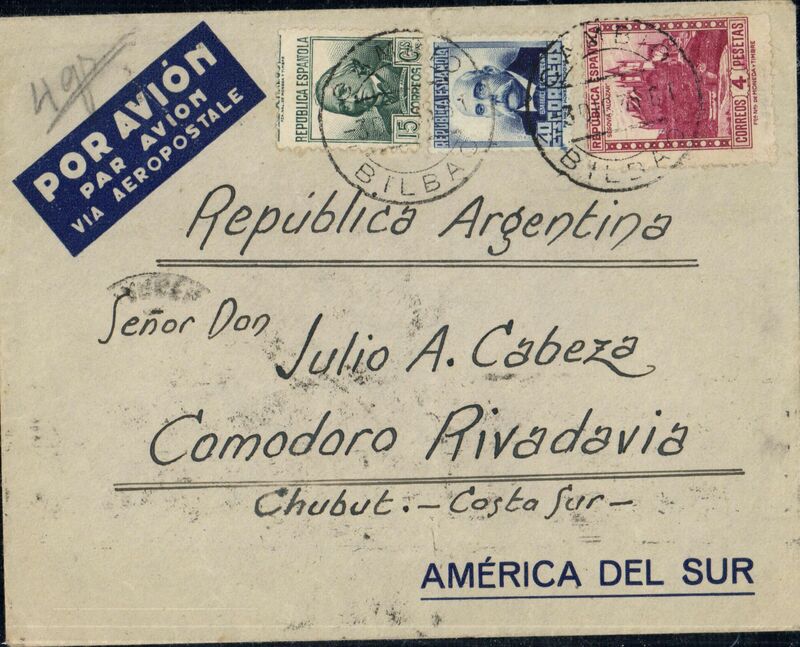 Carried by LATI all the way from Rome to Rio de Janero, then Syndicato Condor to Buenos Aires, thus avoiding the British censorship on the Pan Am North Atlantic service. 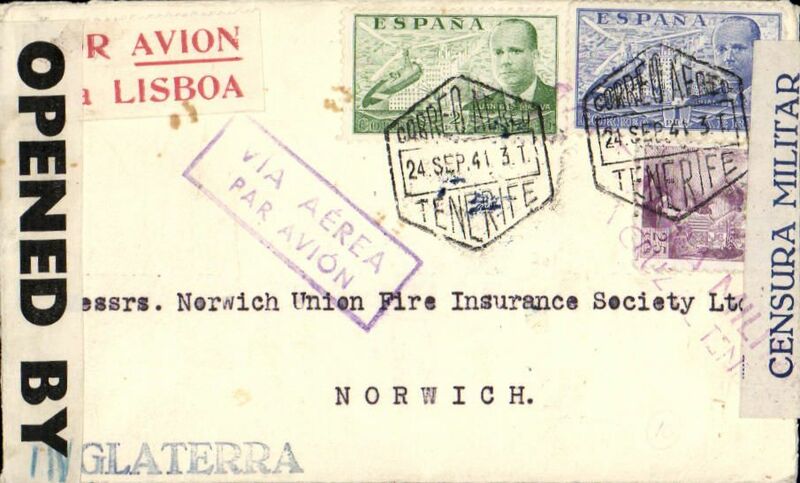 WWII dual censored airmail cover, Tenerife to England, no arrival ds, via Madrid 28/9 transit hexagonal postmark, plain cover franked 3P25 canc black hexagonal Correo Aereo/Tenerife/24.Sep.41 postmark, scarce red/white "Por Avion/via Lisbon" directional vignette, violet framed 'Via Aerea' hs, sealed grey/black Spanish Censura Militar/Santa Cruz de Tenerife, and B&W British OBE 721 censor tapes. Nice item. 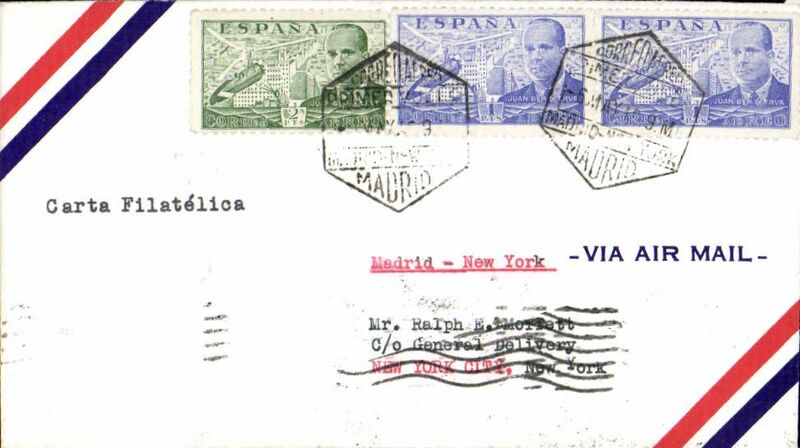 Spain to Argentina, flown by LATI, single rate censored WWII registered (hs) airmail cover, Barcelona to Buenos Aires, black circular '66/Certificados/Central' registered mail reception of Buenos Aires Main Post Office verso, franked 7P 30c canc, canc Barcelona 20/10/41 boxed and hexagonal cds's, typed, blue boxed 'Por Via Aerea' hs, Spanish blue boxed "Censura Gubernata/Barcelona" censor mark on departure. 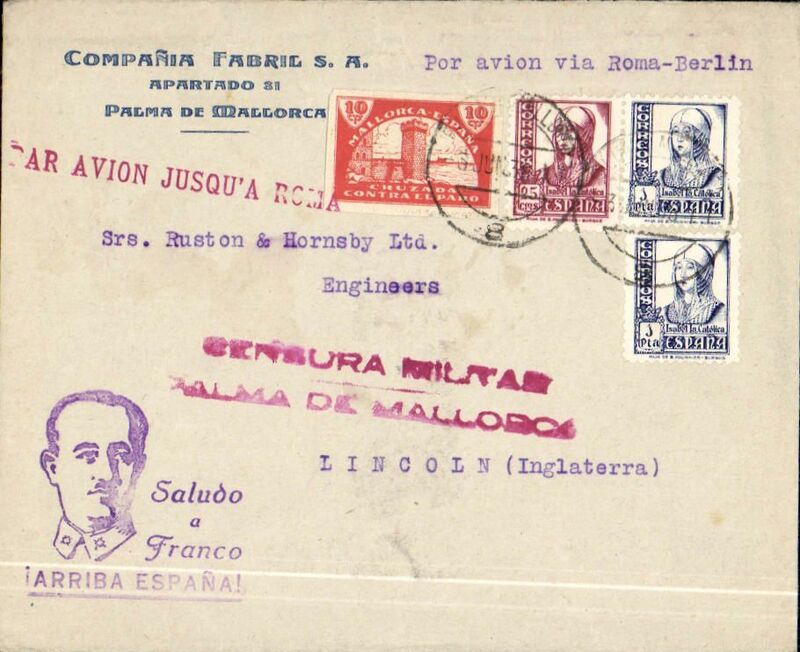 Military censorship of the mails was still the rule in Spain for some years after the end of the Civil War. Correctly rated for 5g registered Spain to Argentina by LATI, 6P/5g air fee + 30c/20g surface + 1P registration. 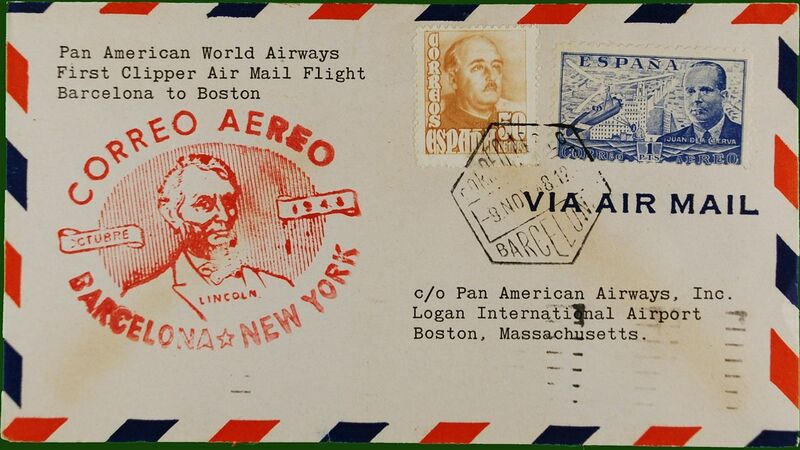 Carried by LATI all the way from Rome to Buenos Aires, thus avoiding the British censorship on the Pan Am North Atlantic service. 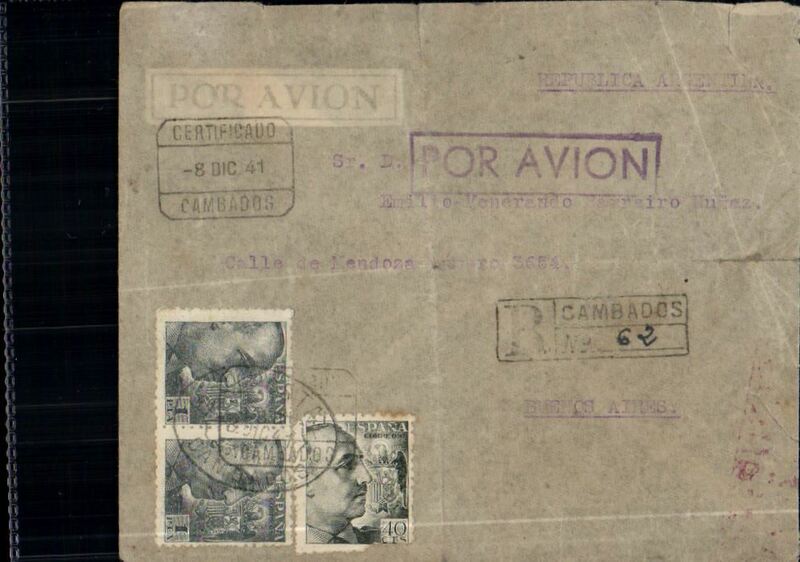 LATI was extended from Rio de Janero to BA in July 1941. 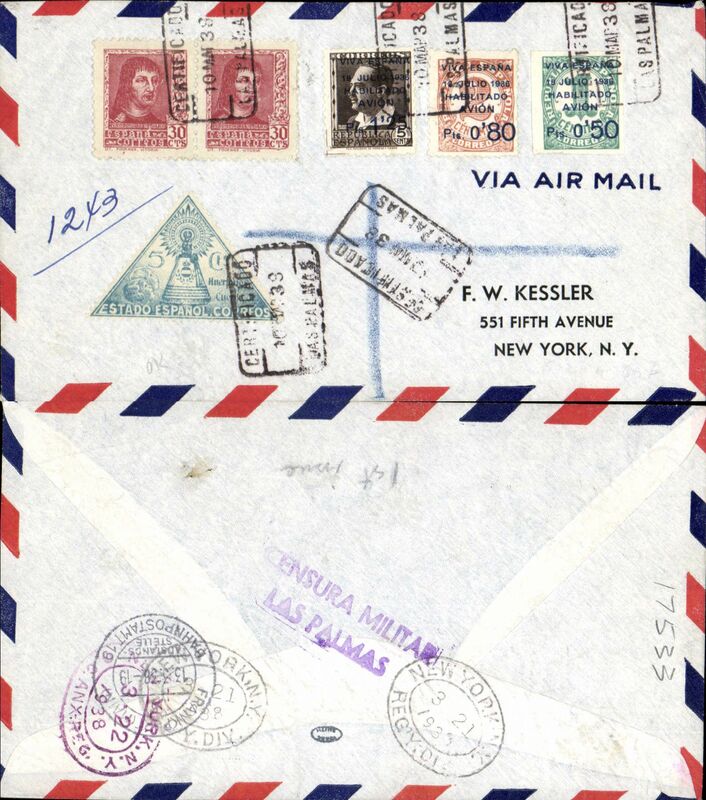 LATI , last or penultimate East-West flight, Cambados to Buenos Aires, no arrival date stamp, via Madrid 10/12, censored registered (hs) grey imprint etiquette airmail cover franked 7P 40c (corner damage), violet framed 'Por Avion' hs, German censor mark verso. Ironed vertical and horizontal crease. The last LATI E-W flight left on 19 December - and the one before that on 13 December. 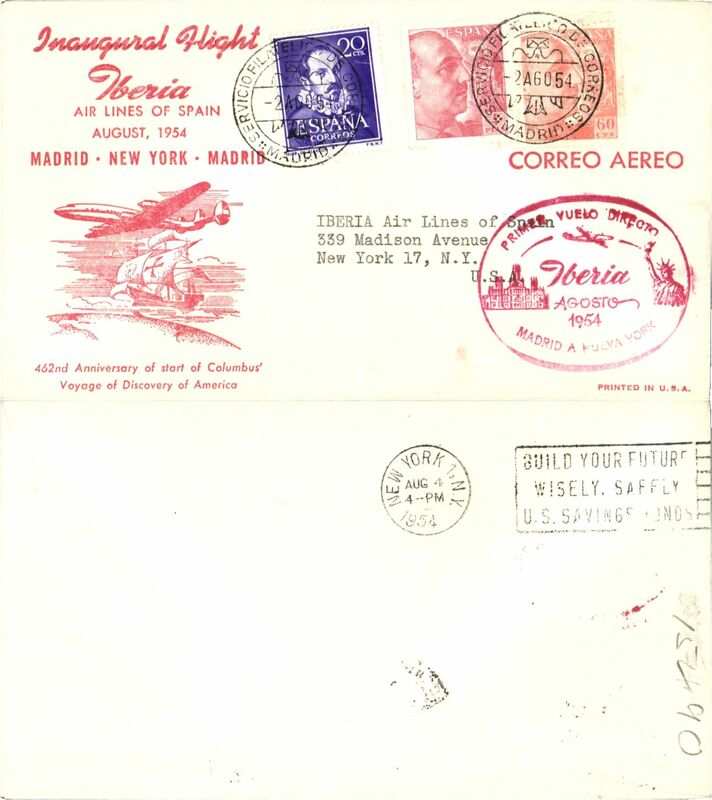 TWA, F/F alternate routing from Madrid to Rome, via Lisbon/Madrid, Madrid to New York, bs 8/5, airmail cover franked 4P. Verso violet framed hs "Embassy of the United States of America/Apr 25 1946/Madrid". 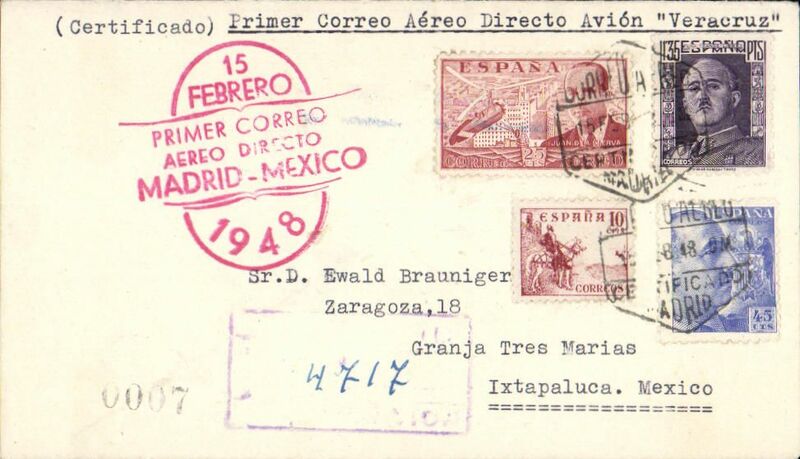 Aerovias Guest (Mexico), F/F Madrid-Mexico, bs 20/2, registered cover franked 2P 10, large red F/F cachet, typed "Primer correo Aereo Directo Avion'Veracruz". 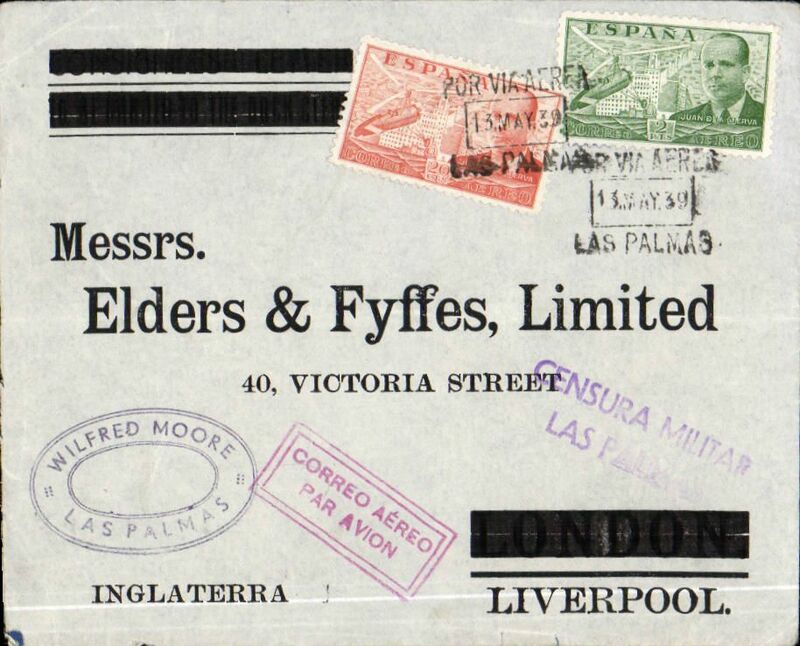 Iberia, F/F Madrid to Bata, Guinea, bs 30/6, brown/cream souvenir cover franked P4.15, large red flight cachet. 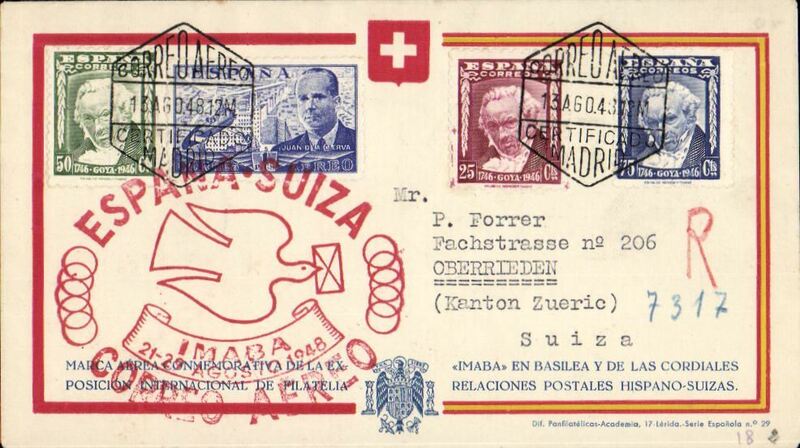 Special flight, Spain to Switzerland, Madrid to Basel, red cross cover, large red flight cachet, Swiss Airmail Catalogue #SF 48.6 cat 125 SwF. 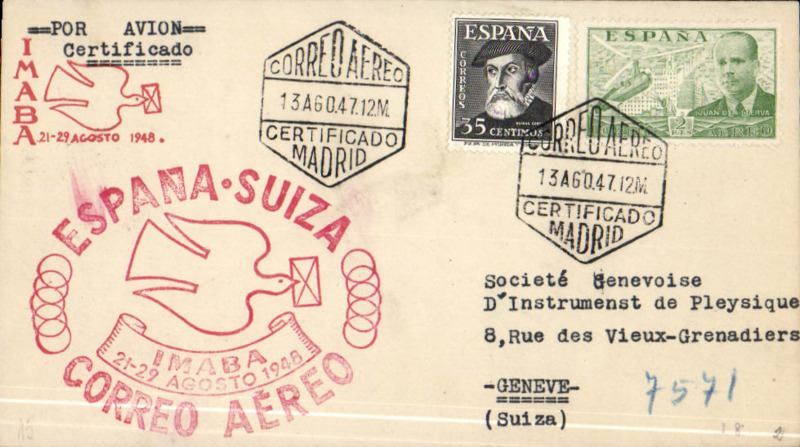 Special flight, Spain to Switzerland, Madrid to Basel, red cross cover, large red flight cachet, Swiss Airmail Catalogue #SF 48.6 cat 125 SwF. Year incorrect on date stamp - should be 1948 not 1947. 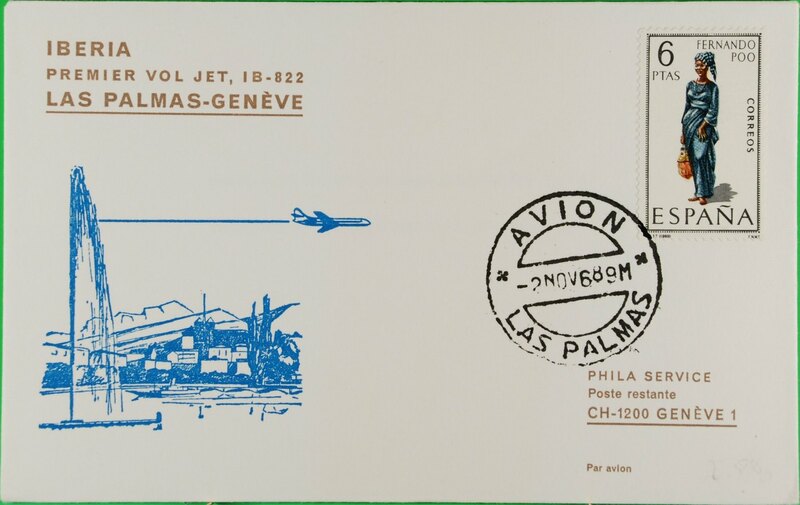 Pan Am F/F FAM 18 Barcelona to New York, red cachet, b/s, air cover. 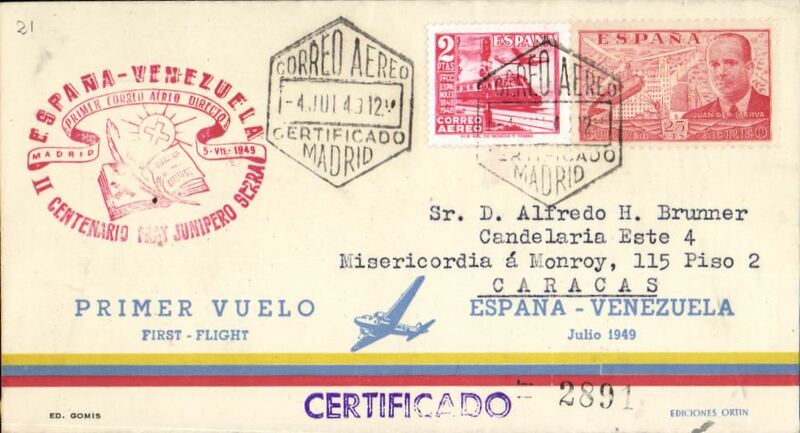 Iberia, first direct flight Madrid to Venezuela, bs Caracas, souvenir cover franked 2P25, large red flight cachet. 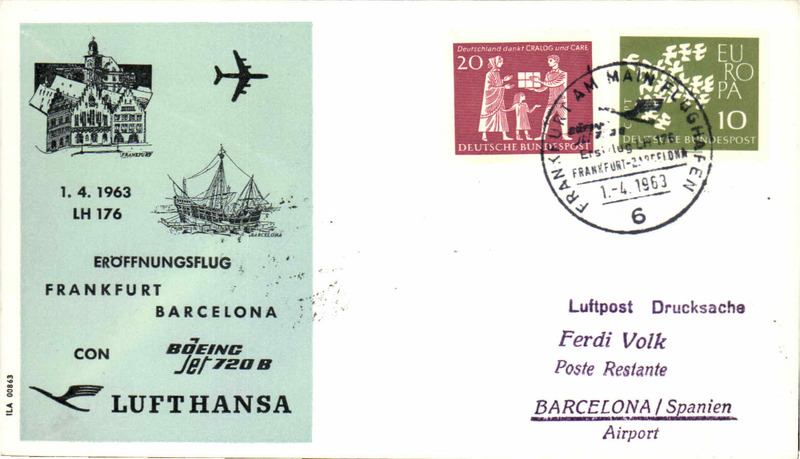 Mahon and Barcelona, 30th anniversary of airmail post, souvenir cover, red circular flight cachet. 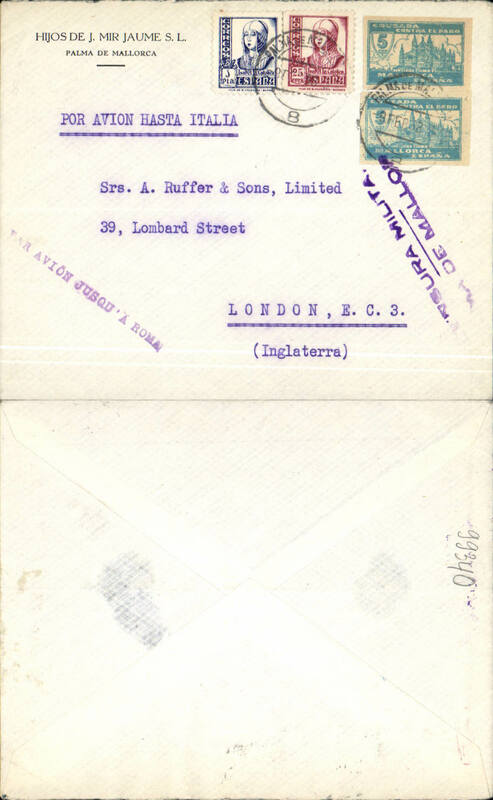 BEA F/F, Barcelona to London, no arrival ds, plain cover franked 1.65P, violet double ring cachet, red/yellow airmail etiquette. 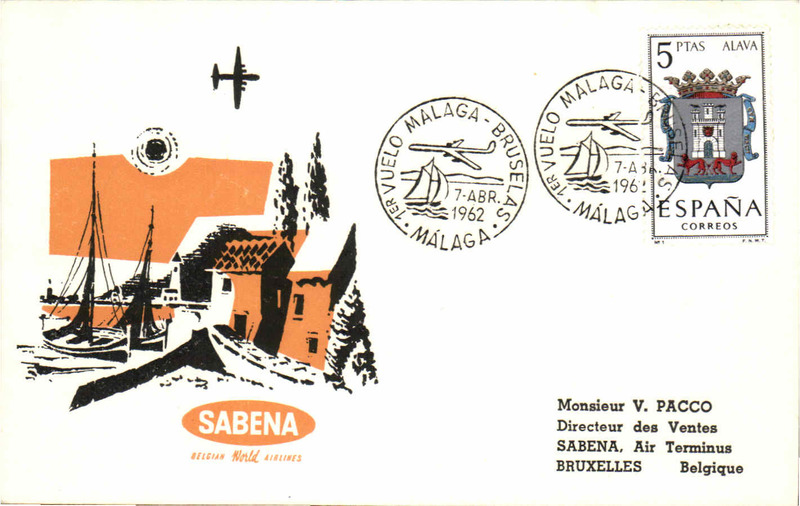 Sabena F/F Majorca-Brussels, souvenir cover, flight cachet, arrival ds on front. 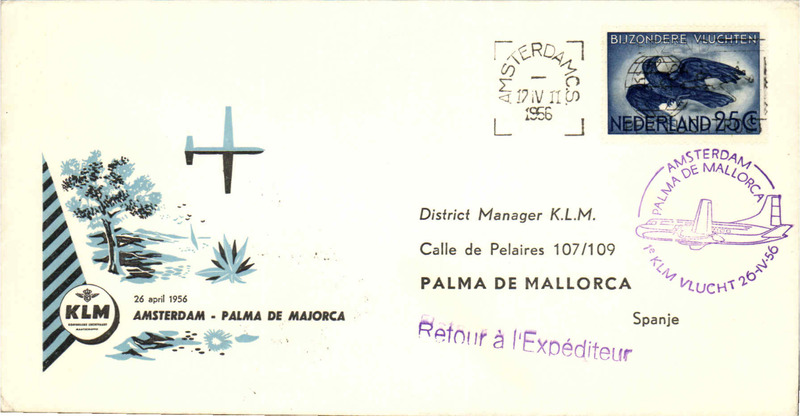 KLM F/F Amsterdam-Palma de Mallorca, cachet, b/s, souvenir cover. 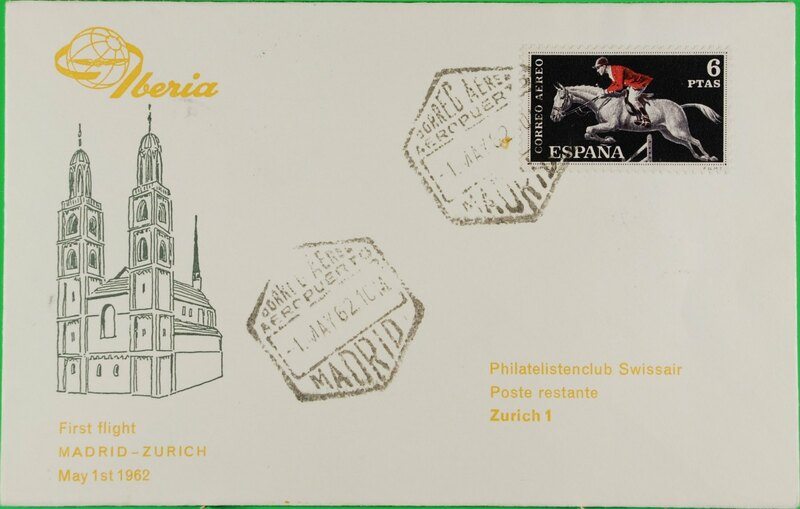 Iberia F/F Madrid-Hamburg, souvenir cover. 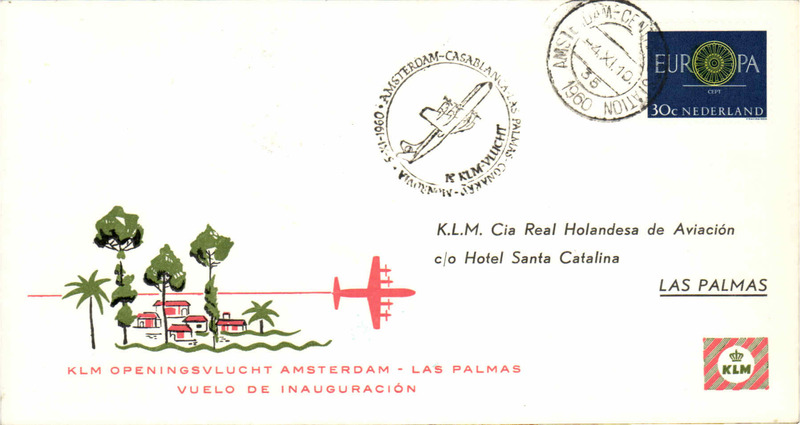 KLM F/F Amsterdam-Las Palmas, cachet, b/s, souvenir cover. 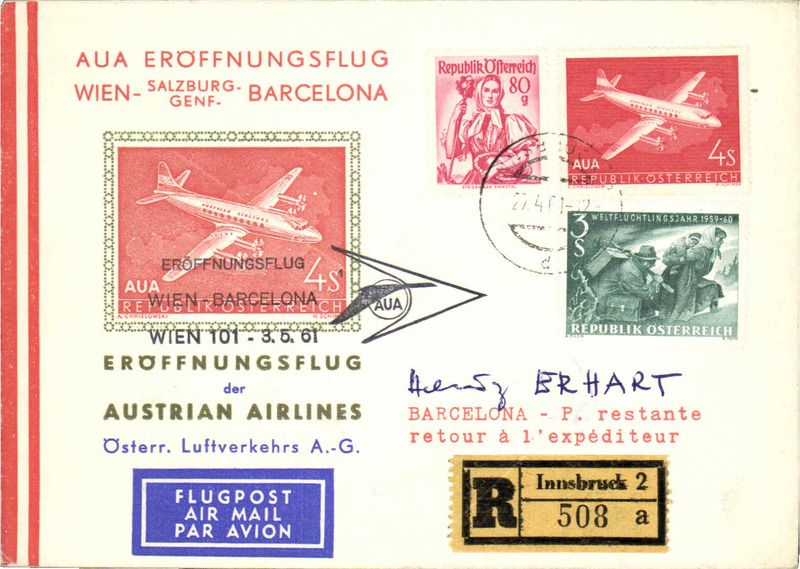 Austrian AL, F/F Vienna-Barcelona, and return, cachet, b/s, souvenir cover. 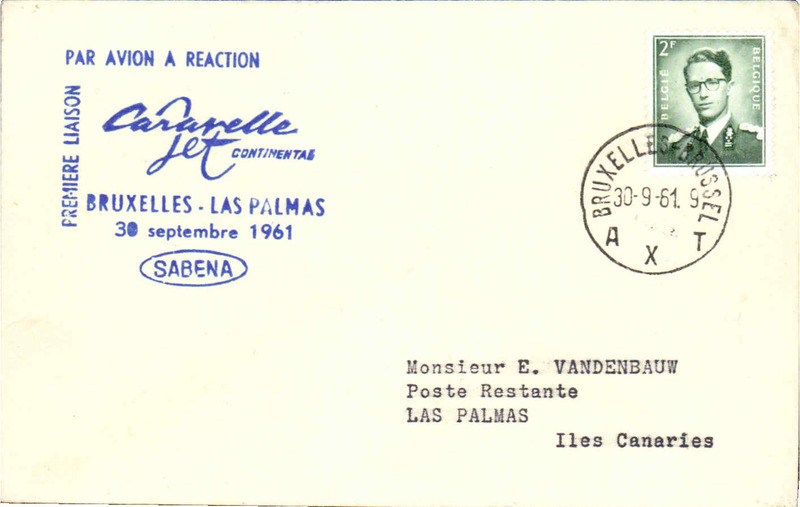 Sabena Caravelle F/F, Brussels-Las Palmas, cachet, b/s. 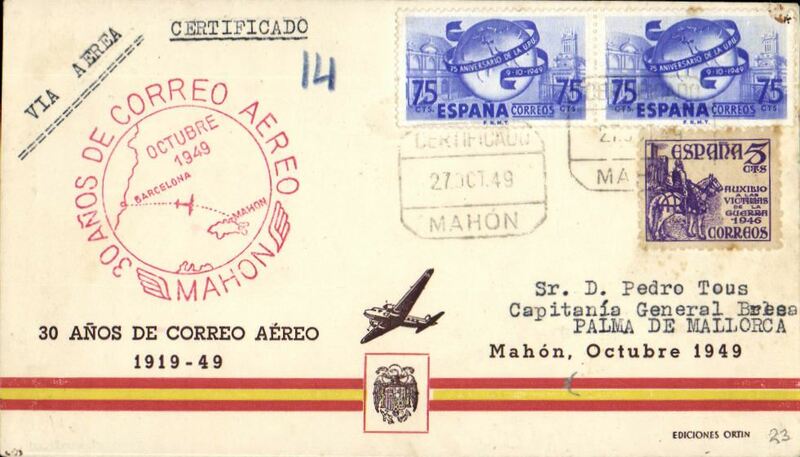 Sabena DC7 F/F, Brussels-Malaga, cachet, souvenir cover, b/s. 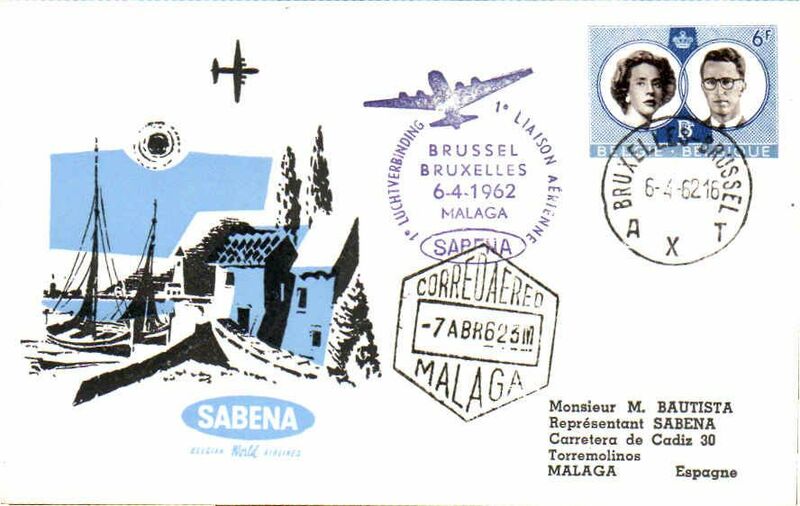 Sabena DC7 F/F, Malaga-Brussels, cachet, souvenir cover, b/s. 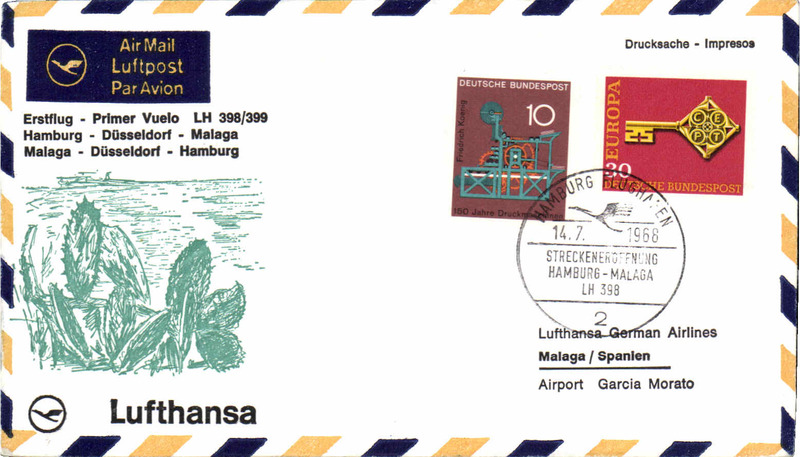 Lufthansa B720 F/F, Frankfurt-Barcelona, b/s, souvenir cover. 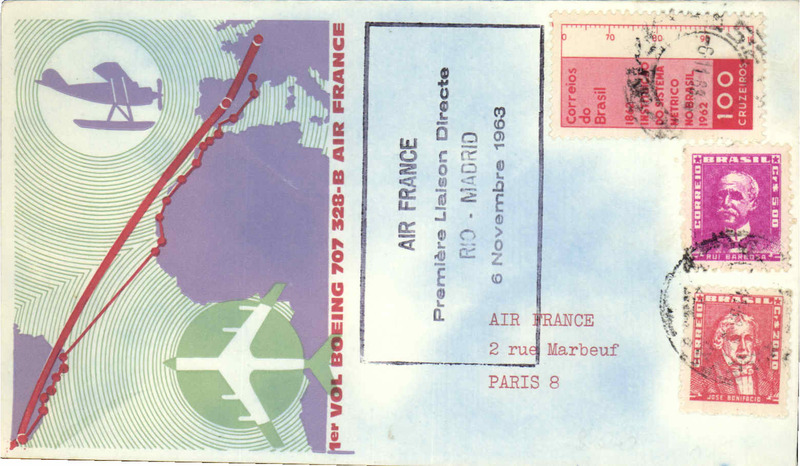 First direct flight, B707, Rio to Madrid, black cachet, no arrrival ds, attractive illustrated souvenir cover, Air France. 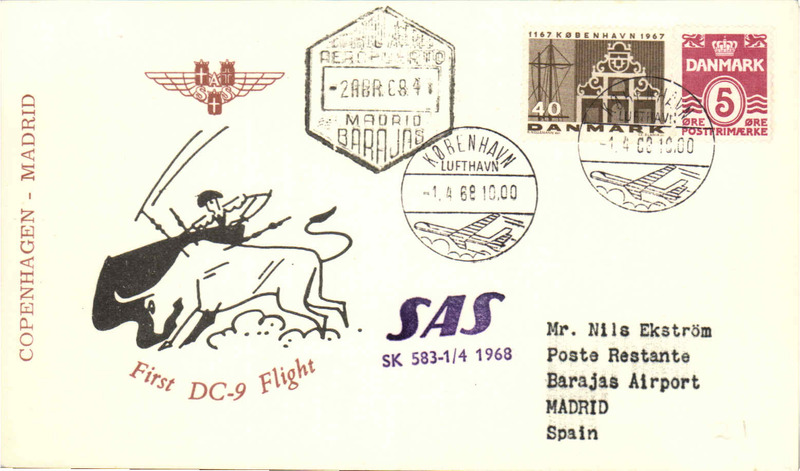 SAS First DC9, Copenhagen-Madrid, arrival ds, souvenir cover. 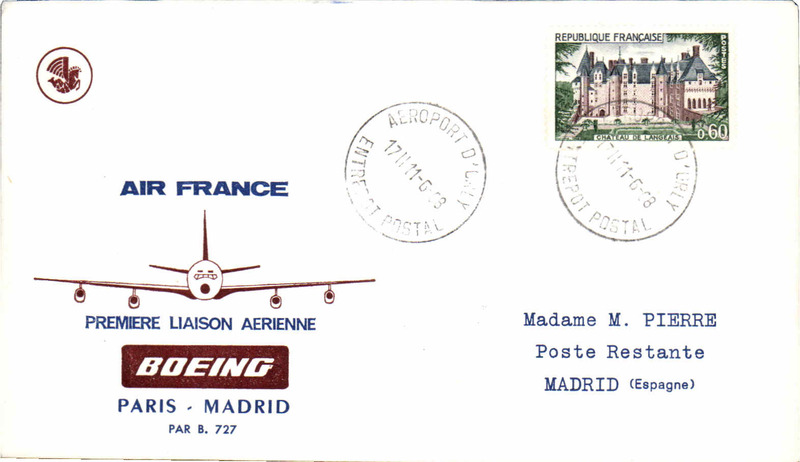 Air France F/F B727, Paris-Madrid,b/s, souvenir cover. Lufthansa F/F B727, Dusseldorf-Malaga, b/s, special cancellation. 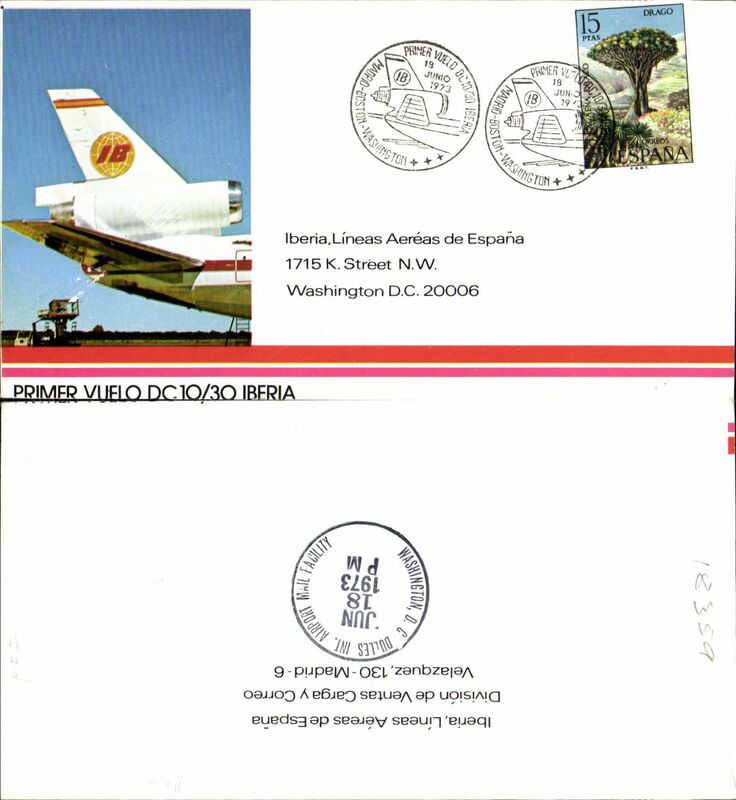 Iberia, F/F DC10, Madrid-Washington, bs 18/6, special depart canc, souvenir company cover.